With all the cupcakes we've been making lately (and cakes, there were two cakes too, but that's another story), you would think I would be done with treats. You would think I'd be happy to leave my baking cupboard closed for few days and give the mixer a rest. You would think that would be sensible of me. If you think that, you're thinking wrong. It isn't my offense though, this return to sugar and sweets. I didn't mean to become truly, deeply, madly obsessed with the thought of gingersnaps for two weeks straight. I blame it on the Grandparents. I know it sounds cruel that I would place blame squarely on the well-intentioned shoulders of my children's grandparents, but I call them like I seem them. Benjamin came home with a cookie from Grandma. Not surprising, of course, as Grandmas are made of cookies (and Grandpas of candy, don't you know). Being the sweet little man he is, Ben was prompt to share his snack with me as soon as he walked through the door. His sweetness may have been slightly influenced by his inability to open the wrapper the cookie was presented in, but really that is neither here nor there. Half for him, half for me. I popped my share in my mouth distractedly. I wasn't really even in the mood for a cookie. Benjamin is deeply offended if you do not immediately enjoy the treat that has been shared, so I obliged. This cookie was really very good. Really especially good. And gone. My mind raced to tack down its characteristics; a thin biscuity, wafery cookie. Not cakey in the least. Not crumbly, not delicate, but crisp. Spice, yes, there was spice involved. Where's that wrapper? Think, think, think. Cinnamon, definitely. And ... something else. Ginger? Yes! Ginger was it. 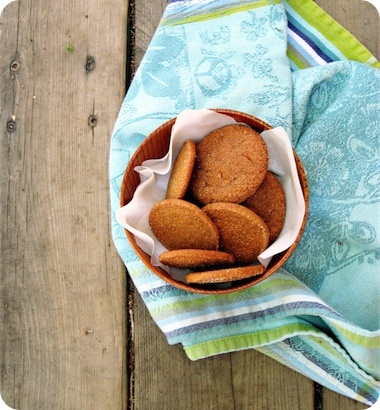 Now I needed to make gingersnaps. I am proud to say my restraint won out, momentarily at least. I exercised the utmost self-control and waited until the flour had settled and the candle smoke had cleared from our birthday celebrations before I did what I had to do. After a few search modifications, and a few pages I struck gold. Well, sugar dusted bronze, to be exact. David Lebovitz. Chez Panisse. Gingersnaps. Done. Unsurprisingly, considering their origin, these are some of the best gingersnaps I have tried. They are spicy without being claustrophobically so. The cinnamon and pepper add deeper dimensions of heat, complimenting the bright fire of ground ginger. • The dough is quite soft, so I used this method to form the logs prior to chilling: wrap loosely-formed dough on the centre of a piece of parchment paper, fold the paper over. Then, holding the two edges of the parchment parallel to the dough together, press a ruler against the log to compress. • I preferred my cookies on the smaller size, rolling the log out to a 1-inch diameter. The cooking time ran about 8 minutes. I also experimented with different thicknesses of cookies, some whisper-thin and crackling, others fat and tender. All were delicious. • I regard to baking times, these cookies do brown quickly, going from deeply-golden to overly-toasted in a matter of moments. Keep an eye on them. • On a particularly-vulnerable evening, I may have taken two of the thicker, softer cookies and sandwiched them with vanilla bean ice cream in between. And on another night, there may have been peaches too. And it may have been nothing short of wonderful.